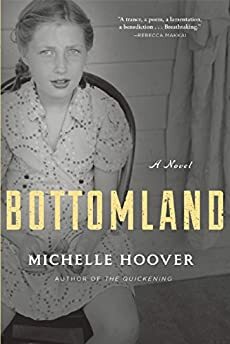 Largehearted Boy: Book Notes - Michelle Hoover "Bottomland"
Book Notes - Michelle Hoover "Bottomland"
Michelle Hoover's Bottomland is a heartwrenching and compelling novel of family and immigrant life. "Deftly imagined and written, Hoover’s second novel offers an intriguing, modern take on a classic American landscape." In an attempt to make my second novel as painful as possible to write, I decided to use five first-person voices. Bottomland is the story of a divided German-American family in the wake of World War I, so the divisions of perception—the way first-person tends to box a writer in with both style and content—seemed the only choice. It should come as no surprise that the music of these voices is what I paid attention to first. The voice of the family's patriarch was the most difficult. A recent German immigrant, his sentences needed a particular cadence. I taught myself German syntax to give his English the faintest lilt, learned what English diction German speakers often get wrong. It wasn't until I began to write the voice of the youngest son who goes to war that the other kind of music became important. The book ranges from the trenches of Germany and France, the rural bottomlands of northern Iowa, and the garment factories of 1920s Chicago. As the settings in the book grew, so too did their disparate voices and songs. Though it tends a little much toward sweetness, the song was a popular sentimental anthem among newly-departed American recruits at the time. It's a song of homesickness, with the singer dreaming of rejoining his loved ones. The lyrics are hopeful, but the distance of the "long trail" makes the tune melancholy, the perfect mix for my isolated squad of soldiers at the end of the war. An American-original, this song predated the U.S. entry into the war. It's considered one of the earliest-recorded protest songs and was rarely heard once America had joined the Allies. In Bottomland, I'm not giving too much way in revealing that the family's matriarch, sickened by her son's recruitment as well as by the vengeful Spanish flu, doesn't survive to see his return. An obvious counterpoint to the previous, this and many American propaganda songs glorified the war effort while also mocking "Kaiser Bill" (Wilhelm II, villainized for beginning the war), Johann Heinrich von Bernstorff (German ambassador to the U.S., rumored to have assisted German-Americans wishing to return home to fight by forging passports), the Krupp family (a 400-year-old dynasty of weapon developers), and the Hindenburg Line—all in ten lines. Strangely enough, the phrase "Tell That/It to the Marines" had been coined in Britain some 100 hundred years earlier as a slur against the British Marines, synonymous to saying: "I don't believe you." The Women's right to vote soon followed the end of the war, as did other progressive movements for women, including a change in uniform. Of course, the root of these changes went back decades, including the early 1880s with the introduction of the first modern bicycle, and the need for women to wear clothing (pants) that would allow them the freedom to ride. "I'll tell you what I think of bicycling," Susan B. Anthony said. "I think it has done more to emancipate woman than any one thing in the world. I rejoice every time I see a woman ride by on a wheel. It gives her a feeling of self-reliance and independence the moment she takes her seat; and away she goes, the picture of untrammelled womanhood." Women on bicycles continued to be an object for ridicule for years. Though it was published in 1895, the song "Eliza Jane" remained popular through the late teens and early twenties, depicting the long fight women had ahead of them. The lyrics combine bloomers, the vote, and the scandal of a young woman daring to ride. Eliza plans to be a man, ‘tis sad to think upon. She wants to pose in papa's clothes; it is for this she pants. By the time Bottomland opens, anti-German sentiment in the wake of the war has done enough to ostracize the family. But it's not until 1920 and the disappearance of its two youngest daughters that the story begins. Like the more-often remembered Al Jolson, certain names filled the 1920 top charts repeatedly: Mamie Smith, vaudeville singer and actress; Marion Harris, the first widely known white singer to sing jazz and blues; and bandleader and singer Ted Lewis, known also as "Mr. Entertainment" or Ted "Is Everybody Happy?" Lewis. The lyrics of the most popular songs are full of love, betrayal, upset, and downright melodrama—the perfect backdrop for the disappeared sisters. With the women's movement under fire, they had even more reason to go. In "Crazy Blues," Harris claims she's near death after the loss of her man: "Now the doctor's gonna do all that he can/But what you're gonna need is an undertaker man/I ain't had nothin' but bad news/Now I got the crazy blues." And in St. Louis Blues, Harris' sings more of the same: "I hate to see that evening sun go down,/'Cause my lovin' baby done left this town." (Later in the same song, Harris strangely claims she loves her man "like a schoolboy loves his pie,/Like a Kentucky colonel loves his rocker and rye."). Only the chorus of Lewis' When My Baby Smiles at Me offers a more hopeful twist: "The kind of light that means just love/The kind of love That brings sweet harmony/I sigh, I cry!/When my baby smiles at me." Pins and Needles ran on Broadway from 1937 to 1940. The title comes from Max Danish, editor of Justice, the newspaper of the International Ladies Garment Workers Union. It doesn't take a stretch of the imagination to understand how the title fits. In cities like Chicago and New York, the garment industry was often the only kind of work that women could get. In the early 1910s and 20s, these were women often sent to the city from home to earn money for their families. They stayed in highly protective boarding houses run by house "matrons," giving them a bed and meals but keeping them to strict curfews and an even stricter modesty code. The union slowly gained power through a number of strikes, particularly one in 1919 Chicago which led to an outright riot. Of course any play about women's work needs its songs and dancing, particularly the kind of work where scissors are a primary tool. In its early shows, the ILGWU workers supplied the cast and the piano playing. Because of work hours, rehearsals took place at night and on weekends, performances the same. The musical was touted as a "lighthearted look at young workers in a changing society in the middle of America's most politically engaged city." Soon enough, enthusiastic audiences spread the word and cast members were able to abandon their factory jobs and perform eight days a week. With songs like "One Big Union for Two," "Vassar Girl Finds a Job," and "We've Just Begun," Pins and Needles is the only Broadway hit ever produced by a labor union. Of course, the real music of the 20s was jazz. New York, New Orleans, Chicago. These were the cities where the jazz and blues scene flourished. From 1917 to 1922, the King Oliver's Creole Jazz Band included such memorable musicians as Louis Armstrong (cornet), Johnny Dodds (clarinet), and Warren "Baby" Dodds (drums). The growing jazz market quickly began organizing field recordings in Chicago and throughout the Midwest. White jazz groups also picked up on the popularity of jazz and vaudeville blues. Ma Rainey released songs such as Prove it On Me, Jealous Hearted Blues, and Trust No Man. Bessie Smith followed suit with No One Knows You When You're Down and Out and A Good Man is Hard to Find. Later, a group led by bandleader Eddie Condon, cornetist Jimmy McPartland, clarinetist Frank Teschemacher, among others, came to be known as the Chicagoans. Once the band moved to New York, their music was labeled by recording executives as Chicago Jazz.